TheSniper- you have very good at it! I am very embarrassed to ask you. Could you us with a little help? We are talking about units of pirates! But we do not know, how them to adapt to this mod! @Ilya Kaudzi: I'm sorry, but i'm noob. I'm trying to make buildings on SketchUp, but i have some problems. 1. Don't know how add textures. 2. Don't know how adjust propietly the anchor. 3. Don't know how create new graphics in Advanced Genie Editor (I like it). This is basically a big house made by copying and pasting AOK graphics (duh?). I liked it very much because there's no flaw in the texture, every part of it is smooth and it have no no-sense graphics mixing. The quality of this graphic is rather good! 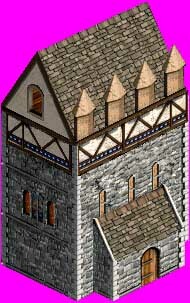 It can be useful to use as a tavern, bar and a house (of course). I'm just not giving five because it's just one graphic, and to make a worthy mod, you need several ones... And because it's a copy-paste graphic. You haven't added any new texture. It's very easy to use Sketchup's textures... Just go to the "Textures" tab, select one and click in the area you want to fill it. Oh, awesome :D. I'm glad you liked it. @Rewaider could you please help me how u do this copy paste? But I guess it's just pick the imgs with Modpack studio and edit them (by copying and pasting), then converting to 256 colors with paint.